You are currently browsing the tag archive for the ‘speed’ tag. ‘The Hockey Champ’ easily is one of the best Donald Duck cartoons of the 1930s. Unlike ‘Good Scouts‘ or ‘Donald’s Golf Game‘, this short is fast paced, full of gags, speed lines and chase scenes, looking forward to the 1940s, the age of chase cartoons. The cartoon opens wonderfully with Donald Duck performing some impressive figure skating, and imitating Norwegian world champion and movie star Sonja Henie. His performance is interrupted by Huey, Dewey and Louie playing ice hockey, and Donald Duck challenges the trio to a game. He indeed shows some impressive ice hockey skills, playing all by himself, in a scene recalling Max Hare playing tennis with himself in ‘The Tortoise and the Hare’ (1935). This is a speedy scene for a 1939 cartoon, but when the Huey, Dewey and Louie take revenge, this speed is retained. There’s a wonderfully silly chase scene underneath the snow, with the hockey sticks acting as periscopes, and, needless to say, the haughty Donald is finally defeated by his nephews. ‘The Hockey Champ’ is an important step towards the faster cartoon style of the 1940s, and still a delight to watch, in contrast to contemporary Donald Duck cartoons, which are as beautifully made, but unfortunately less funny. 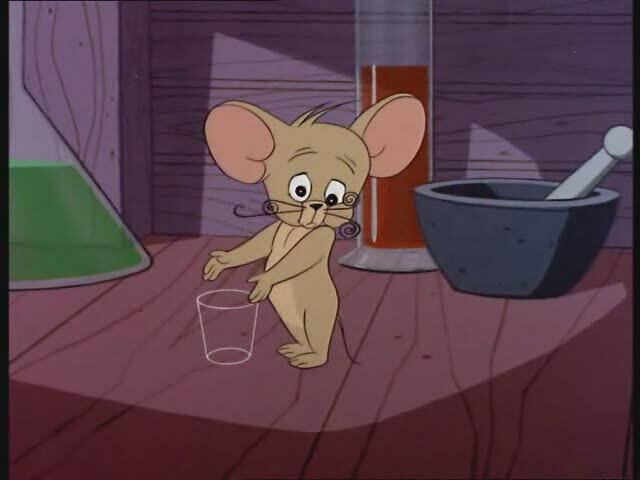 In ‘Is There a Doctor in the Mouse?’ Jerry invents a potion, which makes him lightning fast. Jerry uses his new speed to eat everything that Tom wants to eat. When he runs out of speed he drinks a potion, which makes him enormous, thus abruptly ending the film. Like the Hanna-Barbera Tom & Jerry cartoon ‘The Invisible Mouse‘ (1947), ‘Is There a Doctor in the Mouse?’ suffers from an all too powerful Jerry. When Tom is bullied, it’s not comical, it’s sad. The result is one of the weaker entries in Jones’ Tom & Jerry series. ‘Is There A Doctor in the Mouse’ has the questionable honor to be the first Chuck Jones Tom & Jerry cartoon with a pun in the title. Titles like these would dominate the Chuck Jones Tom & Jerries. They were not their best feature. Apart from being rather trite, they more often than not had nothing to do with the content, at all.